Small camera that can be lowered into a borehole to assess the condition of the casing, observe chemical deposits, or identify obstructions. A digital image is viewed on a monitor screen at the surface and can be recorded as a digital file. 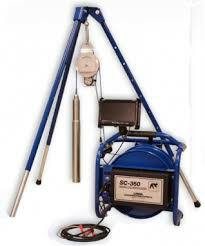 Note: Standard kit suitable for107 m (350'), suitable for 3" - 10" diameter boreholes. 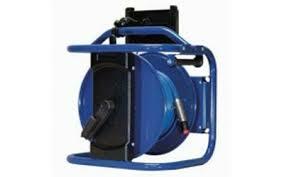 The kit includes the camera, cable reel, pulley sheave, and monitor. A tripod is not included, it can be requested or made in the field. Note: For deeper boreholes other equipment from the manufacturer's range can be provided. Deeper surveys correspond to larger diameter holes so, to give more detailed imaging, a camera with both vertical and horizontal views and lighting is offered. 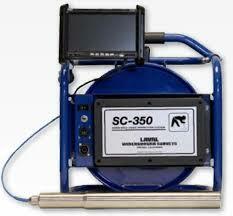 Borehole camera system. Lightweight, compact and portable. Suitable to survey water wells, boreholes and vertical shafts from 2" inches (5cm) to 10" inches (25cm) wide and 350 feet (107m) deep. R-CAM camera: which has downward and horizontal facing lenses.